Escape from everyday life with your next water slide rental. 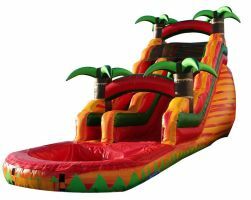 Our 18' Tropical Fiesta Breeze water slide will transport you to the tropical island of your dreams. Hear the palm fronds rustle as the wind blows through their leaves, and feel the cool water splash against your body as you make your way to the pool at the end of the slide.